This past weekend, I was honoured and humbled to participate in the raising of Reconciliation Pole at UBC’s Vancouver campus. 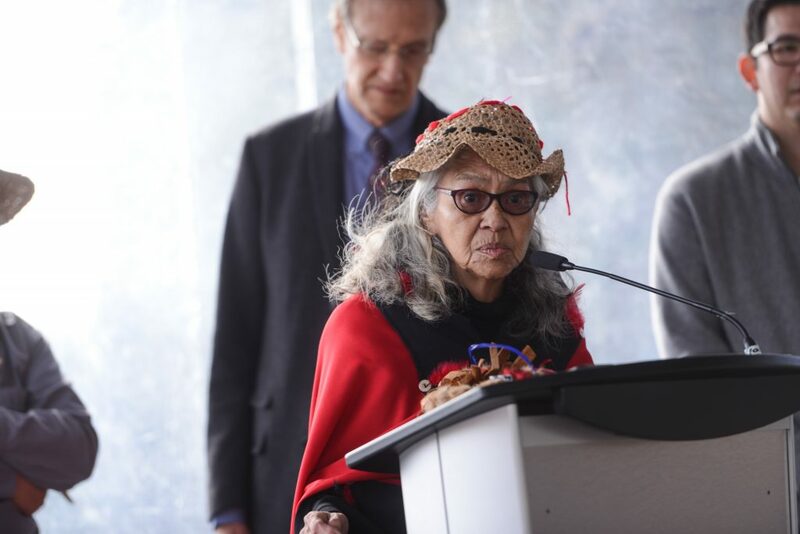 It was gratifying to see so many people turn out for this important occasion and to hear from residential school survivors such as Elder Barney Williams and Pauline Jones (below left), who spoke with courage and candour of the abuse they suffered and witnessed. 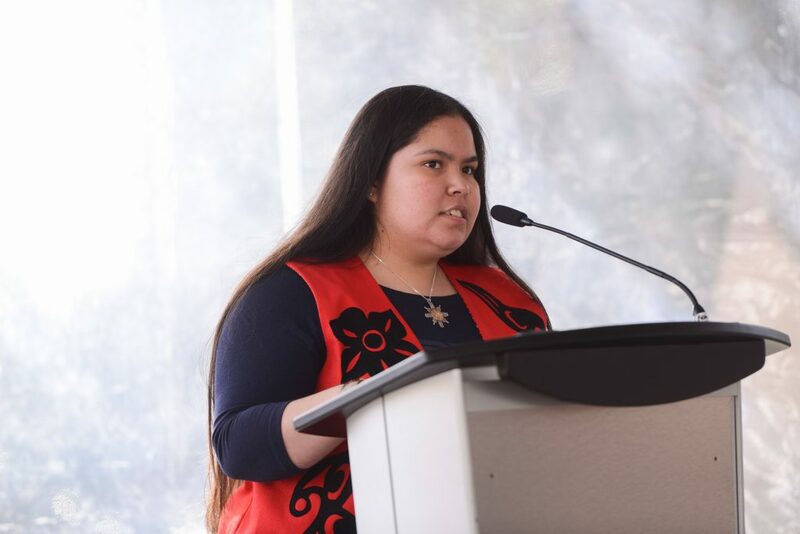 I was also heartened to hear the inspiring speech given by second-year UBC student Adina Williams (below right), who spoke of her parents and grandparents and their experiences with the residential schools and her vision for a future where Indigenous and non-Indigenous Canadians can live in harmony and reconciliation. 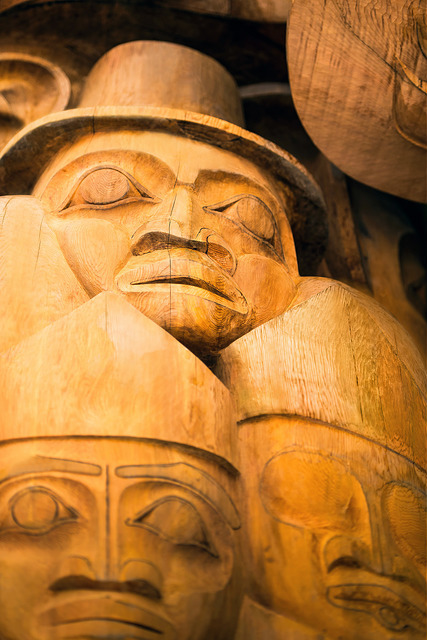 The 55-foot red cedar Reconciliation Pole was carved by 7idansuu (Edenshaw), James Hart, Haida master carver and hereditary chief. 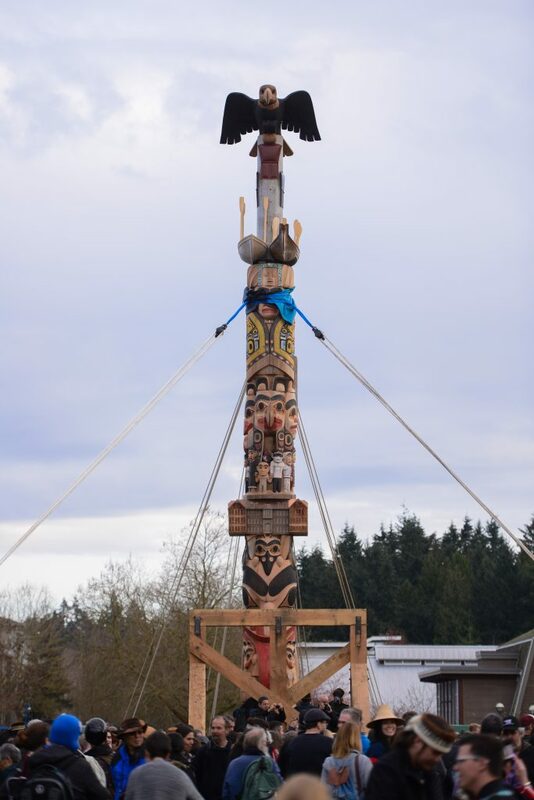 It was jointly commissioned by the Audain Foundation and UBC and was installed in a traditional Haida manner facing north on Main Mall near Agronomy Road, on the traditional, ancestral and unceded territory of the Musqueam people. Reconciliation Pole symbolizes the experiences of residential school students and the path toward reconciliation between Indigenous and non-Indigenous peoples in Canada. The pole tells the story of the time before, during, and after the Indian residential school system – a system that began in the 1800s and ended with the last school closure in 1996. One detail about the pole I found especially moving: the thousands of copper nails that were hammered into the pole. The nails represent thousands of Indigenous children who died in Canada’s residential schools. The nails were hammered one by one by residential school survivors, affected families, school children and others. The bottom half of the pole represents the time before Indian residential schools and features salmon, a bear and a raven. A schoolhouse, fashioned after a residential school Hart’s grandfather attended, is carved in the middle with students holding hands above it. 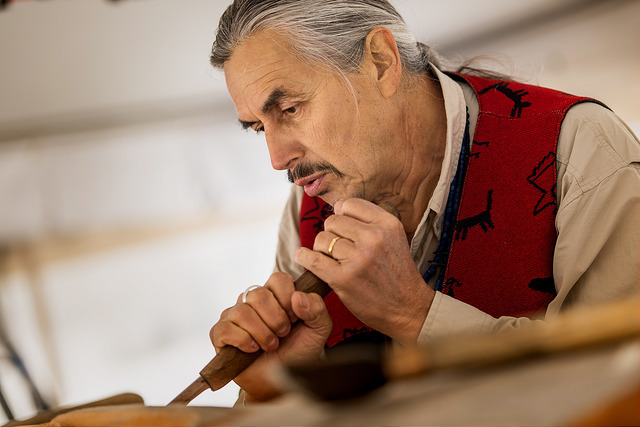 Hart (pictured at work, below) carved the pole from an 800-year-old red cedar tree in Haida Gwaii, on B.C.’s north coast, before it was barged down to Vancouver. He spent the past several months on campus working on the finishing touches before Saturday’s ceremony. Fittingly, the pole looks toward the future site of the Indian Residential School History and Dialogue Centre, which will provide survivors and their families with access to the records of the Truth and Reconciliation Commission of Canada, and give UBC students and visitors ways to understand the history and lasting effects of Indian residential schools. The centre is expected to open in the 2017/18 academic year. Together, the pole and the Indian Residential School History and Dialogue Centre will provide a landmark and a place to better understand the history and lasting effects of Canada’s Indian residential schools. We cannot change the past, but we can honestly recognize it. As the scales fall from our eyes, we can see clearly what we did not see before. James Hart’s carvings are truly breathtaking and the pole reflects UBC’s commitment to provide continued education and awareness about the Indian residential school system and the steps we must take to move forward together. When I look at Reconciliation Pole, I can’t help but feel pain and sorrow. The work tells the story of the time before, during, and after the Indian residential school system – a system that caused so much harm. But I also feel a sense of deep gratitude, for only in learning the truth can we work together, towards a better future. UBC was honoured to partner with the Audain Foundation to commission this beautiful and powerful work. I wish to extend my heartfelt appreciation to Michael Audain, 7idansuu, and the team of carvers, who have made this historic landmark possible. Listen Up, it’s the Blue & Goldcast! Be a tourist at UBC this summer!